Geraint John has been appointed Welsh Rugby Union Elite Coach Development Manager. The 53-year-old will take up the newly created role from 7 September. 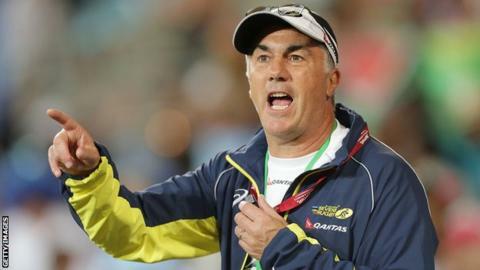 John was appointed Australia Sevens coach in May 2014 but unexpectedly resigned from the position on Monday, denting Australia's preparations to qualify for the 2016 Rio Olympics. "I'm thrilled to have been chosen to take on this exciting new role," John said. "Having spent 10 years away from Wales, I feel I have a huge amount to give back to Welsh rugby, developing the next generation of elite coaches for Wales. "The ultimate goal of this role is to develop our top, up-and-coming coaches so that we have Welsh coaches who can coach Wales. "I'll be looking at our national age grade and pathway coaches, and working with coaches within the regions and the Premiership to see how we can help and support them." Former Cardiff Blues assistant coach John left Wales in 2006 to become Rugby Canada's High Performance Director and then served as their Sevens head coach from 2010. WRU Head of Rugby Josh Lewsey said: "Strategically, this is a vital new role and we are delighted to have secured the services of such an experienced coach as Geraint. "His track record speaks for itself and his knowledge of Welsh rugby is considerable."